Safe with insurance - Our charter car are covered by Insurance for any accidents. ・Hotel Pick up and Drop off in South area (Basically, Location of Pick up and Drop off should be the same. Toll road fee, Parking fee. Any additional hours will incur an additional fee. It is Rp. 80,000 / per hour / per car. After purchasing, you will receive confirmation mail. Voucher will be sent in 2 working days. *If you wish to coordinate the plan, we will send you a voucher once the plan is finalized. 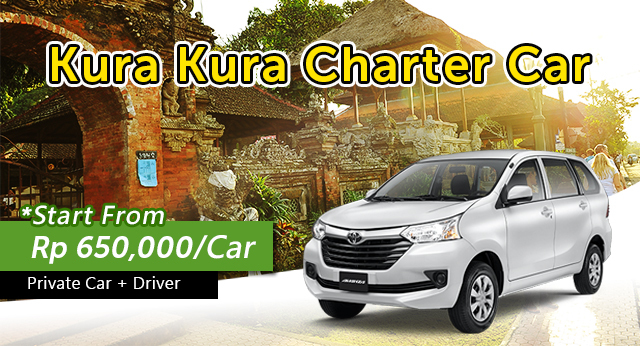 The driver will pick you up at the Hotel while holding the paper with Kura Kura Logo on it. Please show your Voucher to the driver. Now, it is time to depart! Reservation : Reservation is required until 2 days before the date of use. Note : All reservation will be considered a "no-show" at 1 hour past your scheduled pickup time and will result in cancellation. Cancel Policy : No refund after purchased. You are allowed to change your schedule at least 48 hours in advance of your start time of the reservation.